Arkham Knight is the first PS game I actually really played. Normally I am extremly lousy in console games, I grow up on PC classics like Wing Commander, Ultima Underworld etc. Consequently I have big troubles to use a console controller. But Arkham Knight motivated me enough to PLAY the game. Naturally I wanted an AK Batman. The new Mk 8 AK Batman suit is just too cool looking! So as soon as KM released the mini I had to get it! 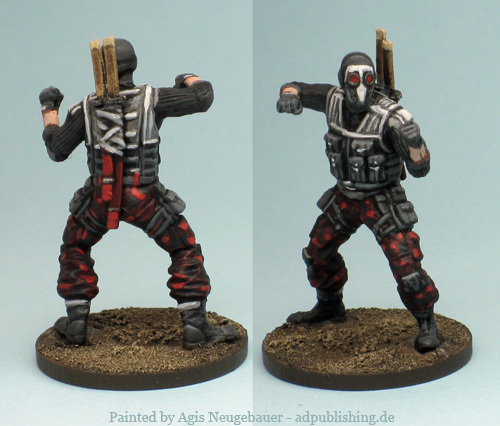 And the Mk8 Suit also gets its Zombicide Card. 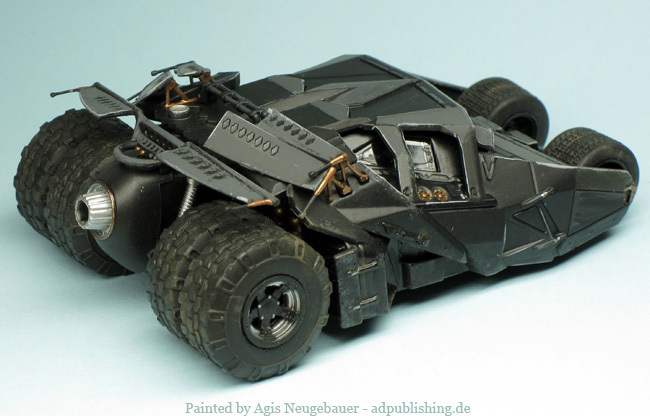 Since the new Batmobile is just too good to be left out I searched for a suitable model. 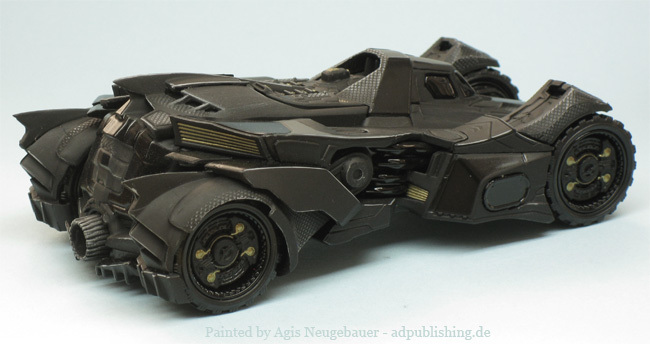 I know of two, the Eaglemoss Batmobile in combat mode and the Hot Wheels Elite car. While the Eaglemoss model seems to be more detailed it is just a bit too big, so I went for the Hot Wheel car. The model below got a bit of repaint here and there. Naturally I wanted some AK minis. 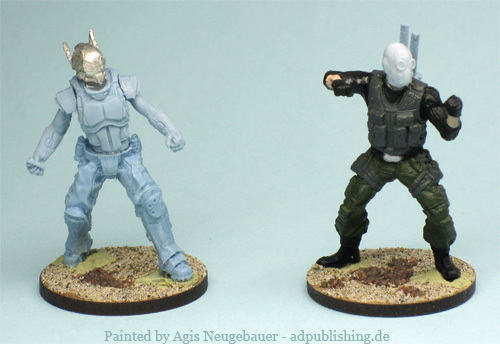 Knight Models will eventually bring some nice minis out, I am sure of that. But I wanted them NOW, so time to dig in the bits box. 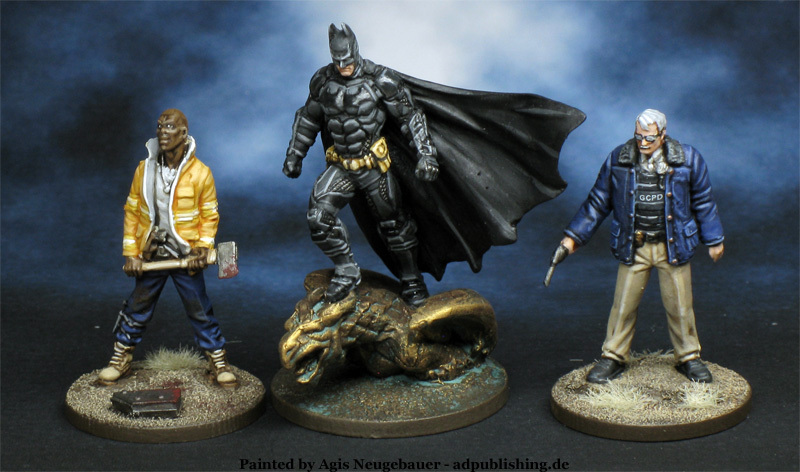 The minis below are a AR armed Arkham Knight gunman, the Arkham Knight himself, a sword thug and a knife fighting thug. 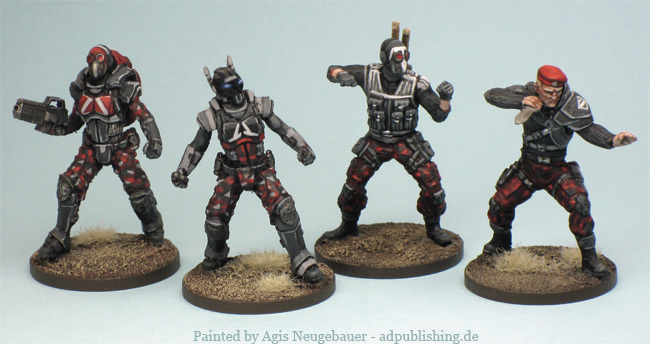 Warzone Light Airborne Infantryman, Warzone Infantry with Infinity head, Heroclix and Knight Model Bane thug. 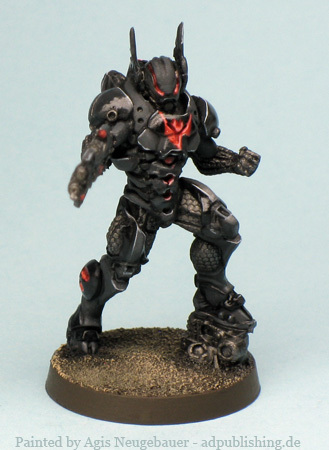 You can see nice Warzone sculpt (really an incredible well done mini!) and the Infinity head. The thug gets a Warzone Airborne head and the sword from the Mishima Samurais. 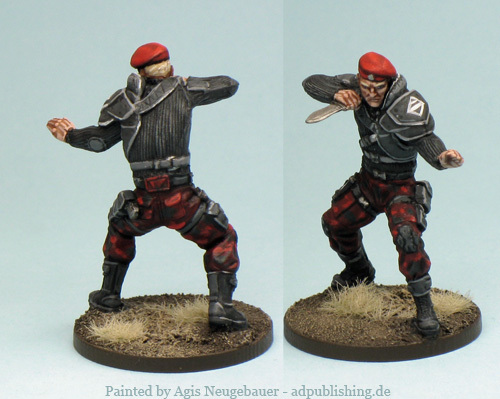 The knife fighter is out of the Bane box, I just painted him in AK colours. Lately I saw the nice Arrow TV Series. It sparked my interested in DC heroes again (I love the 80’s Neal Adams Batman comics). 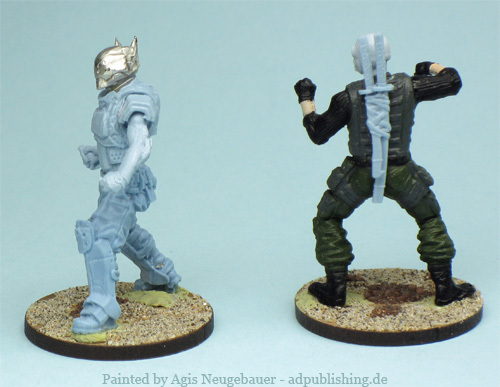 A good opportunity to paint some Knight Models miniatures. 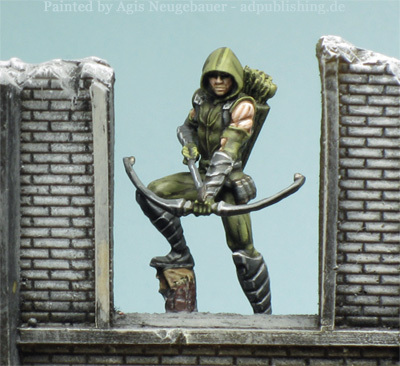 First is Arrow. 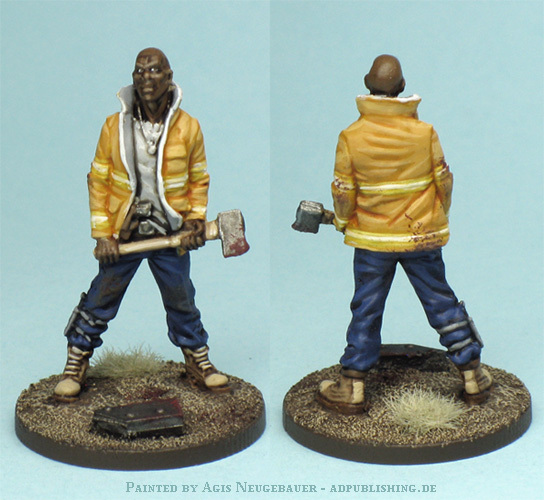 The brushwork on display on the Knight Models website is almost flawless, I can’t compete with them, but since want to use my “street level” Supers in Zombicide games I wanted a more dirty grittier look anyway. There are already a lot of nice custom cards around the net. Just check Castles & Cooks! 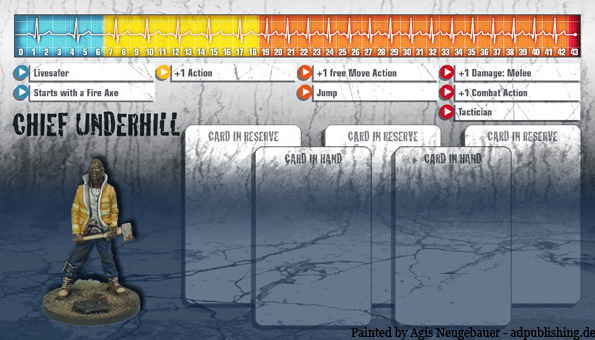 Eventually I will create my own custom card, at the moment I will use Castles Hawkeye card. Best thing IMO, Knight Models Heroes match up really well with Zombicide Minis! A very similar sculpting style and size. 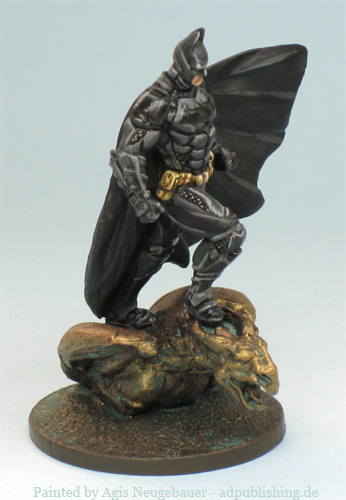 Again a very nice Knight Models sculpt of the Batman - Dark Knight movie adaptation. 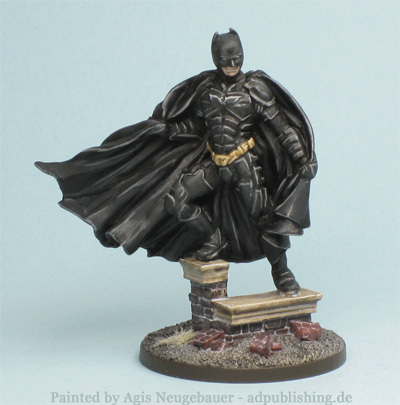 Bit tricky to paint since Batman is mostly black in the movies, only his utility belt stands out. 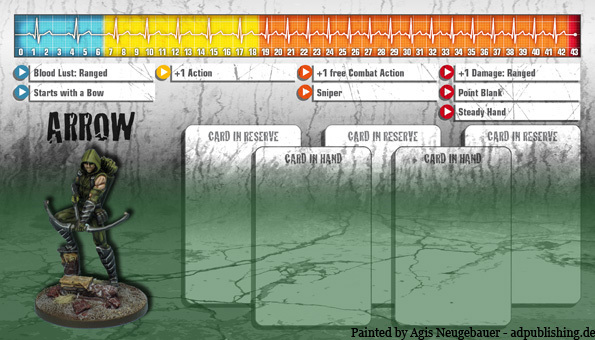 For Zombicide I will use the “Eagle Chaz, the American hero” card. 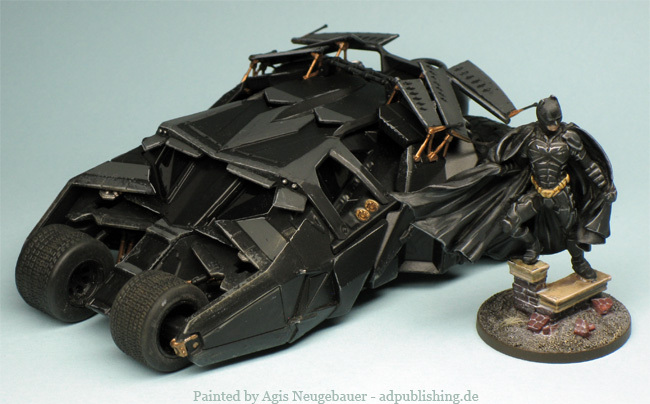 Batman needs a suitable ride, or? The 1/43 Eaglemoss Collection Tumbler fits the bill perfectly! The model was perfect as it was, but somehow I needed to repaint some parts, so some dark grey added on the top parts of the Tumble, some edge highlights and a very light and soft weathering. 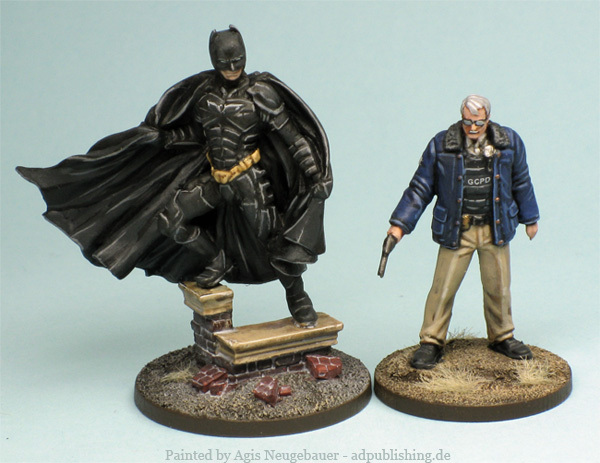 More Batman minis... First is Commissioner Gordon, a Heroclix repaint. 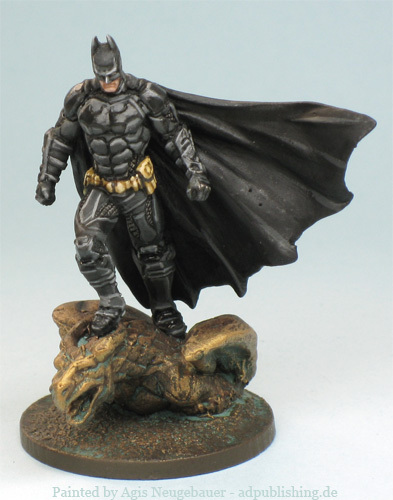 A very nice sculpt which works - IMO - very well with the Knight Model Batman range. 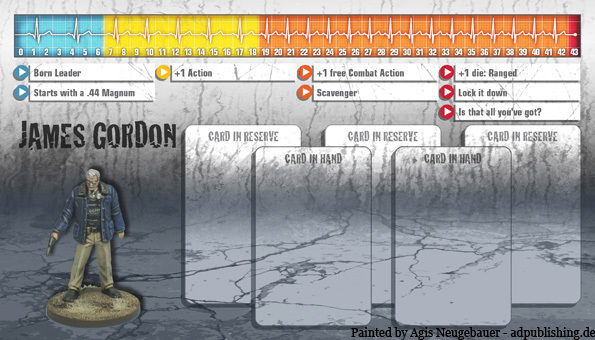 And here we go, my first Zombicide Card. 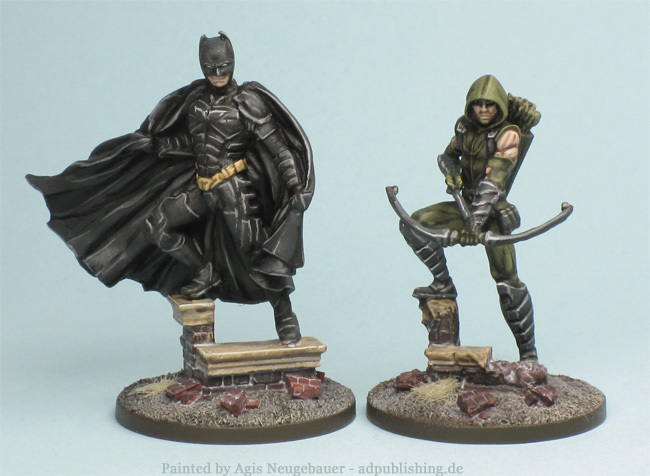 With Season 3 of Zombicide we have almost all the skills that my take on Batman in the post apocalyptic Zombicide world needs. To make him truly heroic I went for the Ultimate Survivor way. So 2 skills right from the start and experience cards for each skill gained. The Dreadnought walker skill is a nice way to represent the Batsuit, mere walkers are not able to scratch the mighty suit! The no guns rule comes from castlesandcooks.com. 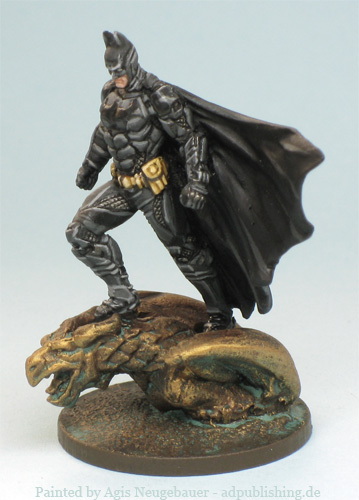 Quote: “"If Batman would equip a gun, he doesn’t. He won’t even carry guns – so if Batman finds a gun while searching, he just leaves it. That also means he won’t even pass it along to another survivor because he’s the goddamn Batman." Yes it is a harsh rule but IMO fitting to Batman. The starting Pair of Knuckles compensates it. Note - The Knuckles are part of the suit and do not take any card slot, Batman can still be equipped with another Melee weapon! 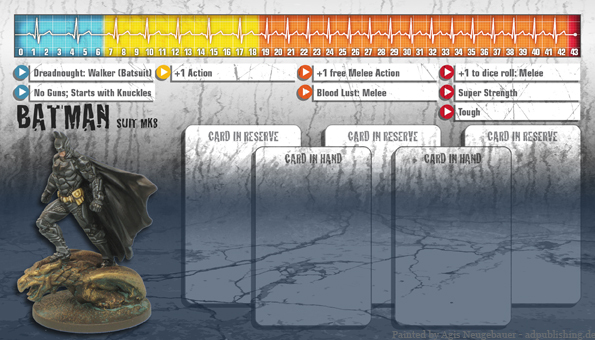 In addition Batman will only take Knuckle related experience cards from the Ultimate Survivor box. At level orange you have to choose if the dark crusader gets a free Melee Action or the very powerful Barbarian skill. At red you have to choose if the Bat hits better, gets stronger or tougher. Have fun!! Commissioner James Gordon, pretty much the same design approach as Batman above. The Ultimate Survivor Box is the starting point, from that on I picked skills that are IMO fitting. Chief Underhill is FDGC Chief. You get him to know at the end of a nice sidequest in Arkham Knight. After Scarecrow forced a mass evacuation of Gotham City by threatening to detonate a chemical bomb on Halloween night, the Firestation 17 unit went to try and put out a fire. However, the firefighters truck ended up stopped by rioters, and each member of the station ended up held hostage. Batman rescued every Firemen afterwards. 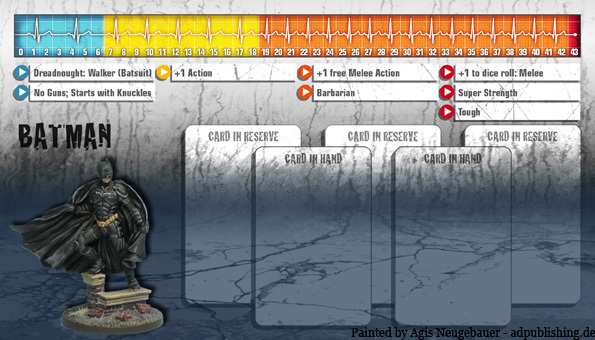 The mini is Dan from the Rue Morgue Box, his stat card is also the same, I just added the Fire Axe. 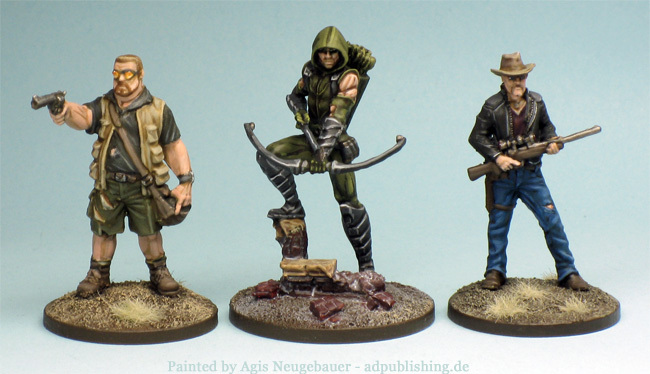 And my take on Arrow for Zombicide. Plays like a charm! Batman What? 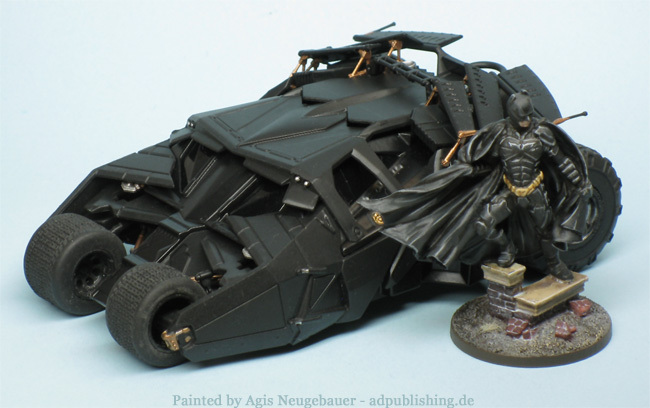 - I can here some of the more unenlighted Batman fans ask.... In fact like me 2 weeks ago. Batman Beyond (aka Batman of the Future) is an American animated television series created by Warner Bros. Animation in collaboration with DC Comics as a continuation of the Batman legacy. It is about a teenaged Batman in a futuristic Gotham City under the tutelage of an elderly Bruce Wayne, the series began airing in 1999, and ended its run in 2001. I was getting aware of it after receiving the really good looking Beyond skin in Arkham Knight. So I searched a bit and got the series. To my amazement I liked it - a lot! Consequently I need a cool mini for it. 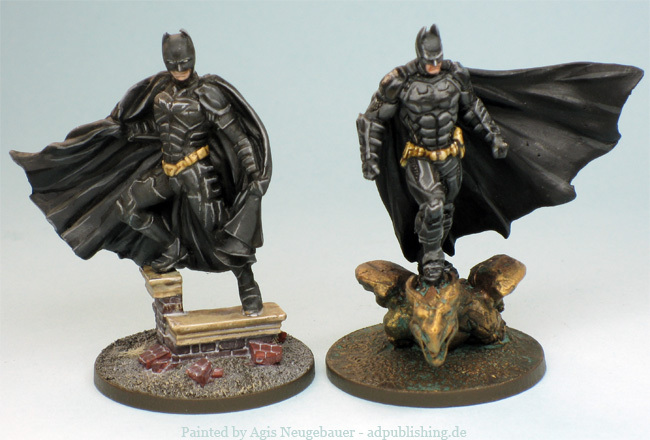 My Arkham Knight conversion made me look into Infinity minis. 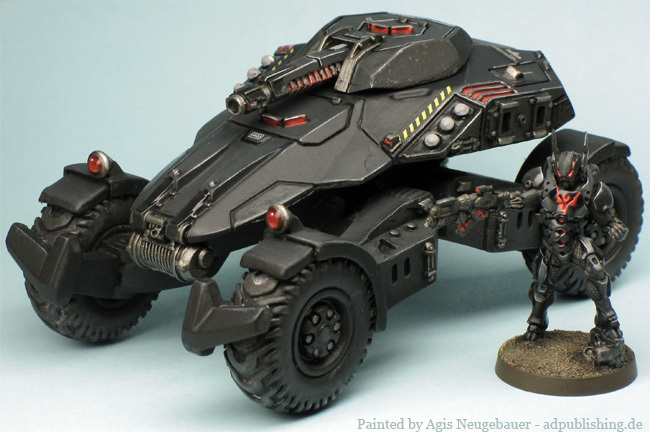 A quick into my lead pile showed me the Nomad new Mobile Brigada. 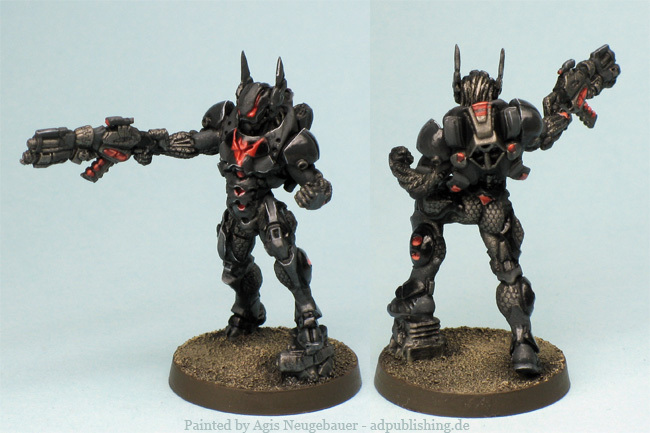 Not a perfect fit, but close, so I filed the bunny ears into pointy Batears and painted him black and red. I am happy with the look. The big gun is not really fitting to Batman, in my eyes it is just the all new Mk 8 Multi Gadget with integrated Remote Hacking Device, Disruptor, Voice Synthesizer, Freeze Blast and Remote Electrical Charge! 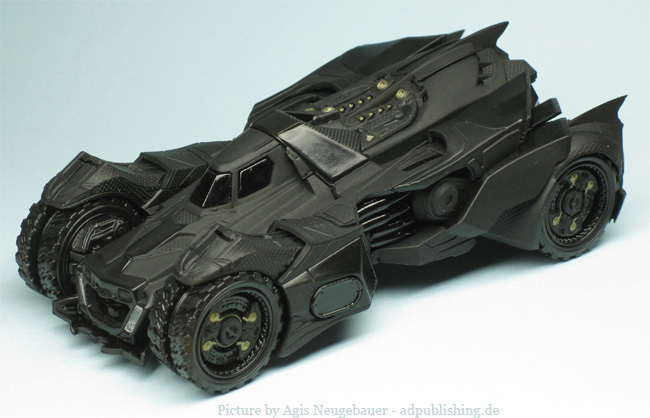 So the Bat needed a new car, or? 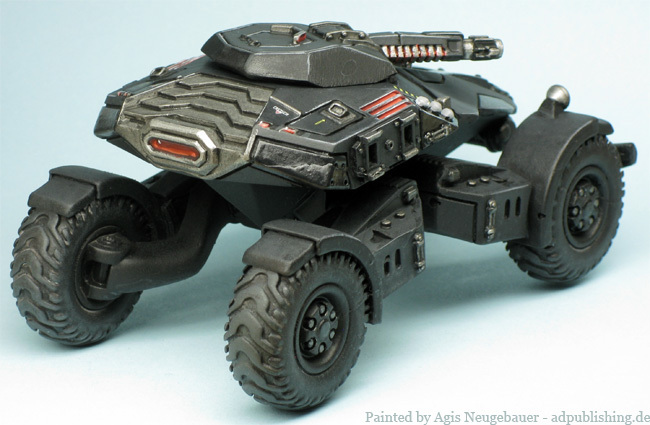 In the animated series Batman is using an ultrasleek hover car, but I wanted a more down to earth rugged car. The Clearhorizonminiatures Nemesis light strike vehicle was just right. 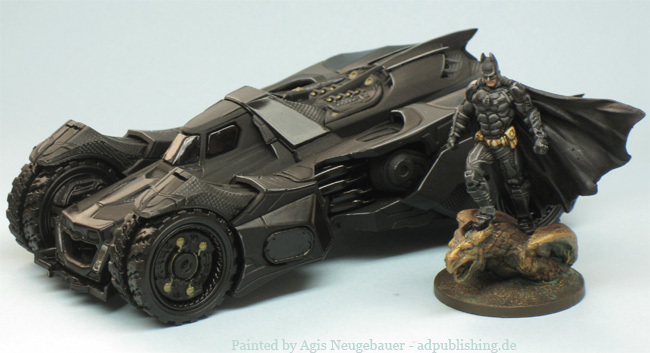 It even had similar weapon and tool loadout as the new Batmobile in Arkham Knight! The gun, the rockets and even a winch! The model is nicely designed but the actual casting is a bit flawed, you can still see some mold lines on the above model (and that is after a lot of smoothing and milliputting...). But if you like the look and are a reasonable modeller go for it!